All we sell are U.S. made mushroom moorings. We can offer you a great price on a complete system to your specs. Selling to Cape residents since 1990. We provide mooring sales and installations anywhere in the Massachussetts and Rhode Island areas. 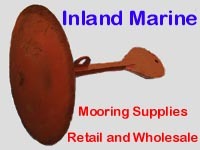 We have mushroom moorings, dormors and dead weight mooring systems available.